(Seychelles News Agency) - A frog endemic to Seychelles will be monitored through a new project set up by researchers from the Seychelles Islands Foundation. The project will monitor the absence and presence of the endemic Seychelles Frog (Sooglossus sechellensis) found in the Vallée de Mai -- one of the Seychelles World Heritage Sites -- located on the second most populated island of Praslin. 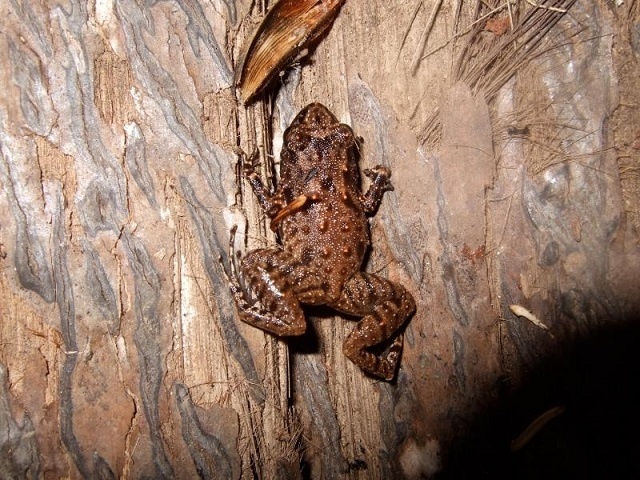 Jennifer Appoo, the Foundation’s science and projects coordinator, told SNA that the researchers will monitor the frogs by listening to their vocalisations using an equipment called a song meter. “Once deployed, song meters record at regular intervals all sounds in the surrounding environment. Song meters can record over periods of days to months and even years and need only be checked as often as required. We will also be deploying small data loggers to be left in the field permanently. These will record temperature and humidity on an hourly basis,” said Appoo. “This project is also therefore aimed at increasing understanding of sooglossid ecology and the environmental requirements of each of the four species,” said Appoo. The project developer, Jim Labisko, who recently completed his PhD on the Seychelles’ sooglossids, said that there is no end date for the programme as the frogs and their environmental conditions should be monitored permanently. “For example, if climate change causes frogs to move to higher elevations, or if a disease arrives and causes a population to decline or become extinct, we need to know when this is happening as it may give us the early warning that we need to prevent the loss of these endangered frogs from the Vallée de Mai and other sites across Seychelles,” said Labisko. “This includes habitat loss and alteration as well as the introduction and spread of non-native vegetation, invasive animals like yellow crazy ants, and pathogens such as the chytrid fungus and Ranavirus, both which are present in neighbouring Madagascar and have wiped out amphibian species and populations across the globe,” he said.